In the past, artistic success for me has been work that I am proud of and know that I have done my absolute best with. But that has been an attitude fraught with dissatisfaction and frustration. There are more times than I like to admit that I look at my past work with twinges of regret. While flaws due to talent, or rather lack of, are disheartening, they are in a way more acceptable than the ones that cause me to shake my head. If I had only been less distracted, had more time, I think to myself, that book would've have been so much better. So, always, the goal has been to make a book that epitomizes the best I could possibly do. However, over the years, I have gotten a bit gentler with my ambitions. I have realized that greatness is not perfection, and in many cases, it is the imperfections that make work great. That, perhaps, the achievement to be proud of is how well the work connects to people. What makes work wonderful and great is its ability to touch a person, not its ability to impress them. But I also realize that you must still offer your best to do that. So now, for me, artistic success is work that is the best I could do at the time and has true meaning to both me and the reader. How do you define professional success? The short answer to this is: the ability to pay my bills! And, really, that is something that I am most proud of. Even at art school, I had teachers tell me that "you can't make a living on children's books." Well, you can--and I am proof. That has always been my number one goal, to be able to do what I love for a living; and doing that is a grand professional success for me. This has always been something I've felt torn about--that sometimes children's book authors/illustrators seem to feel guilty or apologize for earning any money. I suppose it is because the books are for children and our work is seen as either fun or cute. Making books for children is a wonderful job, but it is a job; and we all deserve to be paid for the work we create, as well as be respected. I'd love to have the admiration of my peers--bestseller lists and awards--of course. But "earning my keep" will always be the first gauge of success for me. 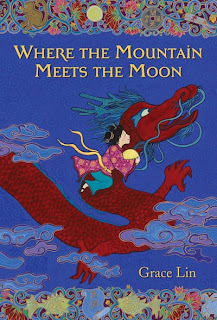 My latest book is the middle-grade novel Where the Mountain Meets the Moon (Little, Brown, 2009). It is an Asian-themed folktale-inspired fantasy where a brave young girl named Minli journeys to change her family's fortune, traveling farther than she ever imagined. It's a fantasy crossed with Chinese folklore and is printed in full color (unusual for a novel). There are ten full-page illustrations scattered throughout the story [see sample image here] as well as two-color chapter headers. This book means a lot to me, I think it is the best book I have written and illustrated so far. It's definitely my best reviewed--so far it has gotten three stars (Kirkus, SLJ, Booklist) and a Parents' Choice Gold Award! I hope that is a good sign! My next book will be Ling and Ting (Little, Brown, 2010). It is an early reader (which is a format I have been wanted to try for a while) about Chinese-American twins. It is almost the reverse theme of The Year of the Dog (Little, Brown, 2006); using twins, I am trying to show, how even when people look the same, they can be different. After that, I have a picture book on the Moon Festival and a picture book set in Beijing. In the meantime, I have starting preliminary drafts for a novel that may become Summer of the Pig to take place in between my past novels The Year of the Dog (Little, Brown, 2006) and the Year of the Rat (Little, Brown, 2008). That may or may not end up working out, but I will hope! Stop by Grace's launch party today at the official website for Where the Mountain Meets the Moon and at facebook! Every month, one of Grace's original paintings goes on auction for charity at www.smallgrace.org.